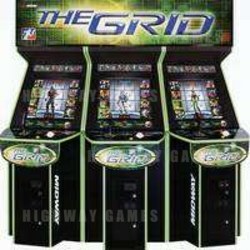 Home	- Arcade & Amusement Industry News	- Midway is proud to present a sneak preview of The Grid! Midway is proud to present a sneak preview of The Grid! The Grid is a futuristic game show that takes sporting events to a different level, where contestants battle each other in a virtual-reality, holographic computer generated arena known as The Grid. Up to six players can compete in front of the studio audience using weapons, super moves (powers) and regular combat. By linking up to six game units, multiple players can compete in front of a simulated studio audience using an arsenal of over 25 unique weapons, super moves and hand to hand combat. "The Grid is absolutely addictive," said Mark Struhs, Vice President of Sales and Marketing for Midway. "The chance to conquer your friends in this kaleidoscopic environment will keep players coming back for more and more." The Grid also offers a compelling challenge to single players as they compete against the clock in a progression through ten mind-boggling towers, each containing six increasingly-difficult levels. "Whether you're engaged in multi-player or single-player mode, the intensity of gameplay remains the same," said Struhs. Players first choose from eight selectable characters, each equipped with his own special weapon and super power. There are a variety of secret characters to uncover as well, like the crazy, yellow-clad game show host. "The goal in creating some of the characters, their moves and even a few of the weapons was to add a dimension of humor to the competition," said Ed Boon, head of the design team. "This is one of the aspects of The Grid that separates it from other action games and gives it such a strong personality." Once the players are unleashed in this virtual world, a survival of the fittest battle ensues where the champion is determined by number of points accumulated. There are three elements obtainable in the environment that can improve a player's odds, including ammunition, health and money. Retrieve these elements in the arena to refuel, extend your character's life and most importantly, win the game. If two players have the same number of points, the player with the most money wins. The control panel consists of a trackball, a super move button, a keypad and a joystick. To encourage repeat play, the keypad allows players to store their relevant information, including names, last level conquered and points accumulated. For instance, if a player completes level four in single-player mode and saves their information, they'll automatically begin in level five when they return to play on that particular unit, or any of the units linked in that group. Another notable feature in The Grid is the operator-adjustable violence settings. In the non-violent version, no blood is shown. Instead, when a character is eliminated, he turns into a grid and fades away. Even though this is a virtual world, and all of the action is an illusion generated inside The Grid, the adjustable violence settings are an added benefit for operators. The Grid utilizes Midway's state-of-the-art Zeus 2 hardware, resulting in smoother, fast-paced gameplay and unbelievably detailed characters. "This fierce gameplay combined with such spectacular graphics creates a virtual world that's as competitive as it is visually-stunning," said Struhs. The Grid is available as a 25" dedicated cabinet. Up to six games can be linked for multi-player action. For more details and pictures, please follow this link. Midway Games Inc. is a leading interactive entertainment industry developer, publisher and marketer of software for both the coin-operated and home markets. Midway games are available for play on all major dedicated home game platforms, including Nintendo64 and Game Boy color, PlayStation game console, Sega Dreamcast and personal computers.